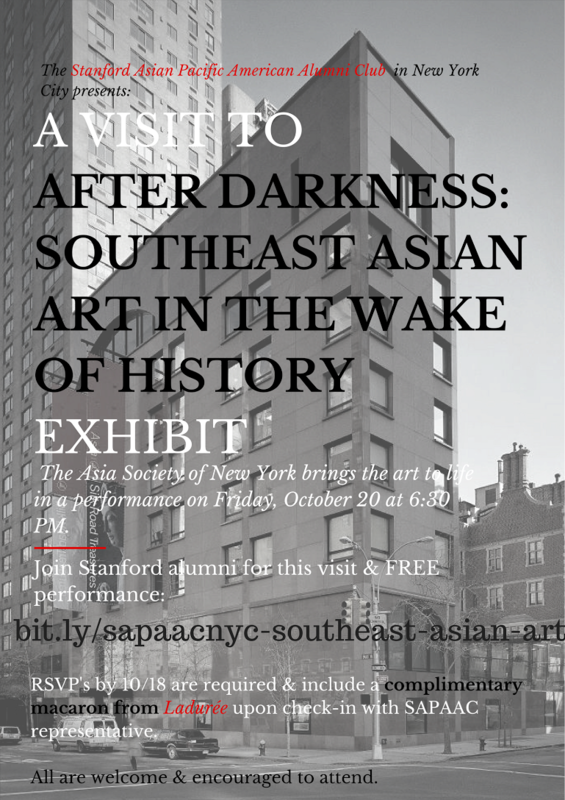 We are excited to bring our Stanford Asian Pacific Islander Alumni in New York together for a visit to the Asia Society's latest exhibit "After Darkness: Southeast Asian Art in the Wake of History." At a time of social and political tension, how should art and artists respond to the challenges of the moment? Does art have the power to change the world or does the world shape the evolution of art? After Darkness: Southeast Asian Art in the Wake of History considers these questions through the work of seven contemporary artists and one artist group from Indonesia, Myanmar, and Vietnam, whose lives and artistic practices have intersected with defining periods of socio-political transition in their respective societies. Featured artists of the exhibit include FX Harsono, Htein Lin, Dinh Q. Lê, Nge Lay, Nguyen Thi Thanh Mai, The Propeller Group, Angki Purbandono, and Tintin Wulia. A description of the exhibit can be found here and a promotional video can be found here. On Friday, October 20, actors bring to life the personal accounts of artists Dinh Q. Lê and Tintin Wulia, who are featured in the exhibition. Followed by a Q & A with the artists and a reception. Eventbrite RSVPs are required & include a complimentary macaron from Ladurée upon check-in with a SAPAAC reprseentative. Please RSVP by clicking here by Wednesday, October 18 at NOON. All are welcome and encouraged to attend.